Trevor H. Smith, one of eight a-n members selected for the a-n Writer Development Programme 2017-18, reviews the GI group show 'Second Nature' and Glasgow-based artist Sarah Forrest's short film, Again, it objects. 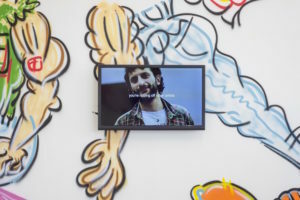 This year’s Glasgow International festival revolved around the role of technology in everyday life, its intersections with nature, and its perceived insidious infringement on the order of things. Two contrasting responses to these themes could be found in ‘Second Nature’, a group show co-curated by London’s Gossamer Fog and ‘nomadic curatorial project’ Home-Platform, and Sarah Forrest’s film at Civic Room, Again, it objects. 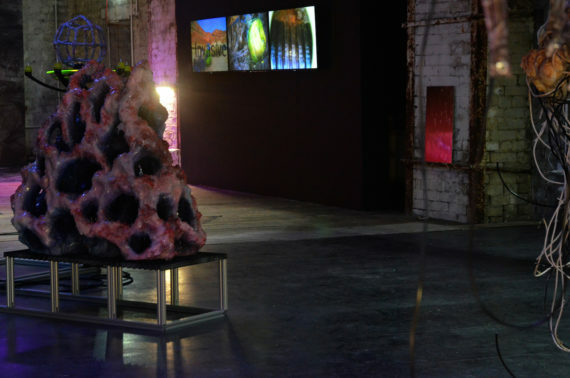 In ‘Second Nature’, Joey Holder’s digitally rendered wallpaper backdrop, Evolution of the spermalege, appears to depict an organic lifeform floating in an underwater environment on a scale that could be monumental or microscopic. 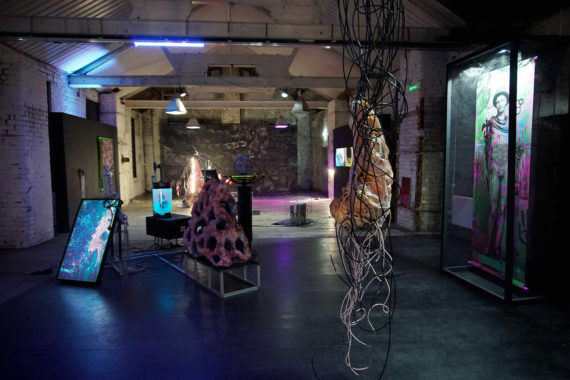 Neon strip lighting, repurposed computer hardware, and amorphous gelatine sculptures invoke the next leap in human evolution alongside hybrid organisms that combine nature and technology to produce new life-forms. Lewk Wilmshurst’s Making Friends with Hands and Eyes (2018) features a drip-fed robotic dog, domesticated and dismantled beneath the kind of wrought iron framework you find in a garden centre. He suggests that, through our comfort with domesticity, we may be sleepwalking into a dystopian future of our own making. More uplifting is Will Kendrick’s Eternity (2018), a caged vinyl print that raises the status of the cultural relics of our time to sit them alongside Greco-Roman statuary. In the future, not even the statues will remain but there will at least be images of the statues. Nearby, a PC monitor displays a flow of images that glitches in and out of recognition and loops occasionally before moving on to a new strand of visual cues. 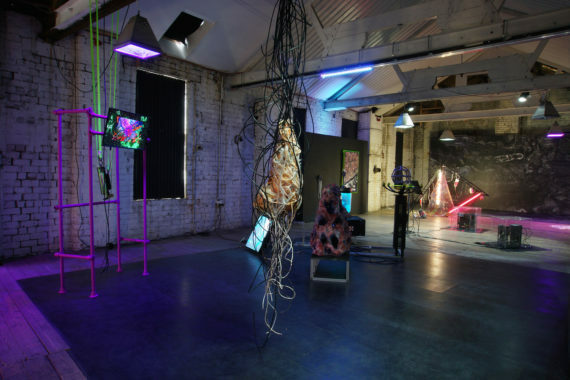 This is Sticky Vectors (2018) by Christopher MacInnes, whose list of materials for this piece is ‘computers, moss, fungus, neural networks, webcrawlers’. There are two dilapidated PC tower units, each encased in Perspex, that have moss and mould growing around them – nature slowly reclaiming its territory – and they are linked to monitors that display the results of the webcrawler software, which has been programmed to ‘look for love’. 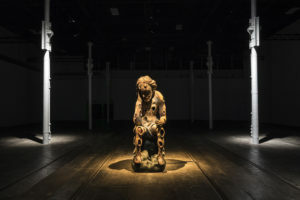 Diane Edwards’ Petrified preserves giant sea kelp roots in polythene and silicon rubber, bridging the gap between the Wilmshurst, Kendrick, and MacInnes’ work to some of the more traditionally sculptural works which, although they respond quite fittingly to the brief, at times have a slightly film-set feel. Ben Skea’s minimal geometric frameworks, Future Exit Strategy (2017), were lost in the drama of it all and felt out of place in a dank, dilapidated old warehouse above a fishmonger’s. Overall though, the works created a sense of an imagined future where the technology of today has been scavenged and repurposed. At Civic Room, Sarah Forrest’s short film, Again, it objects (2016), played in another dank and musty space – this time the back room of a former civic building. The film opens on the drop of a gauze curtain billowing gently in the breeze, while in the centre of the screen a narrative plays out one word at a time to the sound of the opening bars of AC/DC’s Back in Black. The story that unfolds puts you, the viewer, in a domestic setting in which a void appears in the form of a black circle. One by one items from your living room are swallowed up by it, until eventually you jump in. The film speaks of our willing engagement and assimilation with unknown quantities; pertinent at a time when Facebook founder Mark Zuckerberg has recently appeared in front of Congress to explain how his company handled (or mishandled) the personal browsing histories of its 2.2 billion users. Culminating with the protagonist taking a personal leap of faith into the void, Again, it objects highlights our willingness to tap ‘accept’ at the foot of a 30-page terms and conditions document, and to think of as friends people whose unfiltered presence we have never had the pleasure of experiencing. In contrast to the presentational aspect of Second Nature’s imagined futures, and despite its prescriptive central text, Forrest’s film leaves room for the viewer to apply their own conclusions. The void is a mirror, and by staring into it we learn something about ourselves – usually that we wouldn’t mind taking a leap, though it’s never really a leap. We move more like a silent underwater pod, such as the one in Holder’s wallpaper, gently drifting into new surroundings. Like Wilmshurst’s robotic pet dog in a garden centre, what once we objected to eventually becomes second nature. 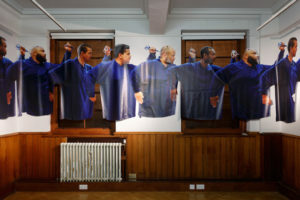 1-3: Installation view, Second Nature, 71 Houldsworth Street as part of Glasgow International Festival 2018. Image courtesy of the artists, Home-Platform and Gossamer Fog. Artists: Will Kendrick, Joey Holder, Lewk Wilmshurst, Eva Papamargariti, Christopher MacInnes, Samuel Capps, Diane Edwards, Ben Skea, and Andrew Sunderland.